If Jesus would’ve asked that question to the nearly one hundred surfers at Crystal Pier in Pacific Beach on November 10th for the third annual Jesus Fish Fest, the answer would have most definitely been yes. 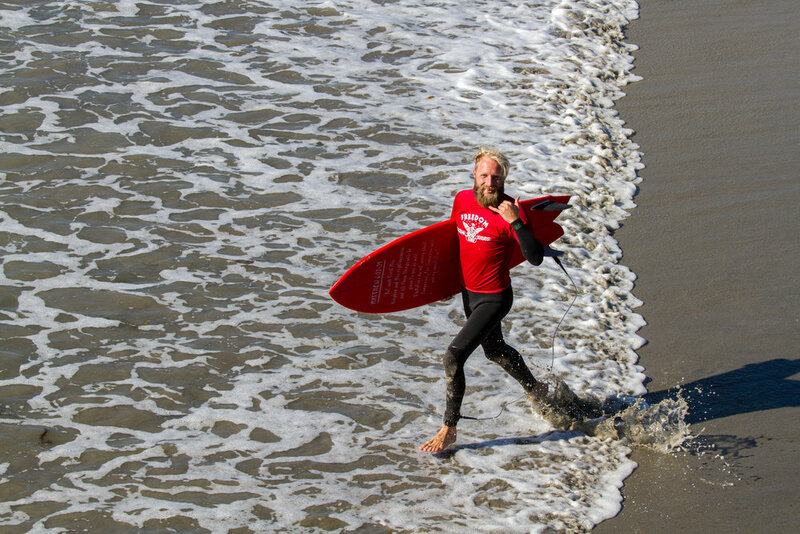 The Jesus Fish Fest is not your typical surf contest. The one that is a competitive grind and only really suited for the home-schooled super grom that is sponsored and competes in a different surf contest every weekend. 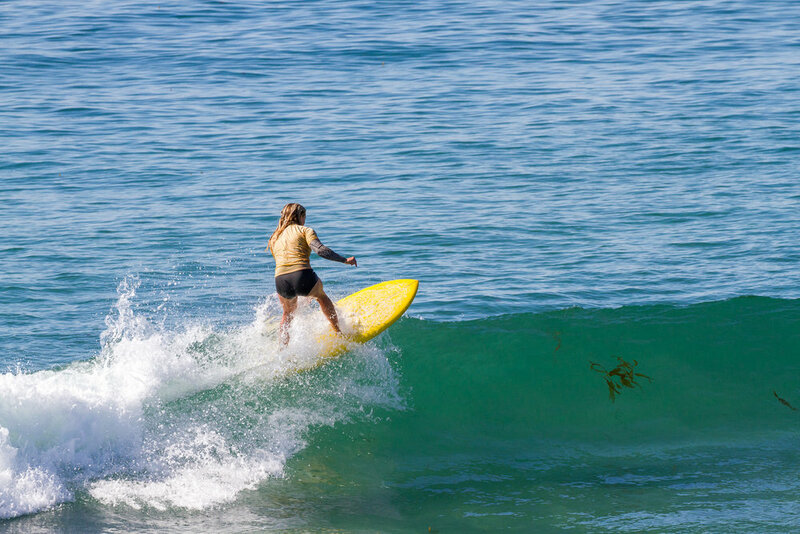 The Jesus Fish Fest is an outside-the-box, fun, community surf contest where all competitors surf on a level playing field. The level playing field is that every surfer in the competition rides the exact same board: an identical 5’7 twin-fin fish. Each fish is shaped specifically for the competition and only waxed up and surfed for the first time on the morning of the contest. The eight fishes, which are all sponsored by local churches in the San Diego area, were shaped by California shaping legend Hank Warner. The fishes are his signature “Starfish” model, a retro fish of the 60’s and 70’s with a twist. The twist is small nub just above the pulled in tail along with a cambered rail which gives the fish additional lift and pivot power to increase the performance. Riding a board that surfers are unfamiliar with and have never ridden before puts them in unfamiliar territory. Especially considering that everyone in the contest, including sponsored ripper groms, 6’5 dudes, and 50+ year old legends in the Masters Division, were riding the same size board. However, the versatility of the fish, which compacts a lot of volume into a small space without sacrificing the maneuverability, allowed for some top-notch surfing throughout the day in all divisions. The winds and waves obeyed during the competition with small but clean 2-3ft waves and light winds throughout the day at Crystal Pier. About a foot bigger would have been ideal for all competitors but nobody was complaining about the clean, contestable conditions. The Open Men’s Divisions, which featured 56 competitors from all-across San Diego county, was edged out by Carlsbad surfer Cheyne Jobbins. Cheyne landed a solid front-side air on a two-foot onshore section during the final to take home top honors. That was one of three airs done throughout the day on the twin-fin fishes, showing that high-performance surfing was possible on the retro fishes. The Open Men were ripping all day long and the other standouts in the final were Josh Denham (Ocean Beach), Shaun Donovan (Pacific Beach), and Mitchel Mccullough (La Jolla), who finished second through fourth respectively. In the Women’s Division another North County shredder, Hanna Van Veen from Encinitas, took the win over Carly Wilson, Hannah Yates, and Hana Pruzansky. Hanna went home with a brand new Degree 33 Fish surfboard which was sponsored for the winner of this division. La Jolla super-grom, Raphael Castro, finished first in the Grom division. Getting back on the tail of the 5’7 fish he was able to throw a few turns to impressive the judges and get the scores needed to take the win over Stefano Graciano (Pacific Beach), Micah Leapley (Oceanside) and Carsten Castaneda (Carlsbad). In the Masters, aka Jedi Division, the contest organizers gave the old-timers the option to ride on the 5’7 Jesus Fishes or to bring a bigger board of their own to surf during their heats. In the first-round half of the Masters rode the Jesus fishes and half of them rode their own bigger boards. As if they were blessed, the four that chose the fishes exclusively advanced to the final. Patrick Giles ended up winning the final over Matt Donovan, Bruce Fearon, and William Walter. This wasn’t the only win for the Giles family as Patrick’s seven-year-old son Logan went home with one of the 5’7 fishes, which was more of a longboard for him, in the lucky draw. While the competition in the water was fierce, this was shadowed by an overwhelming amount of stoke and strong sense of community which made the day so special. Everybody was hooting one another into waves and high-fiving on the beach after their heats. Spencer Lillywhite and some stoked grommets were dishing out entertaining and semi-valuable random facts on the PA system. 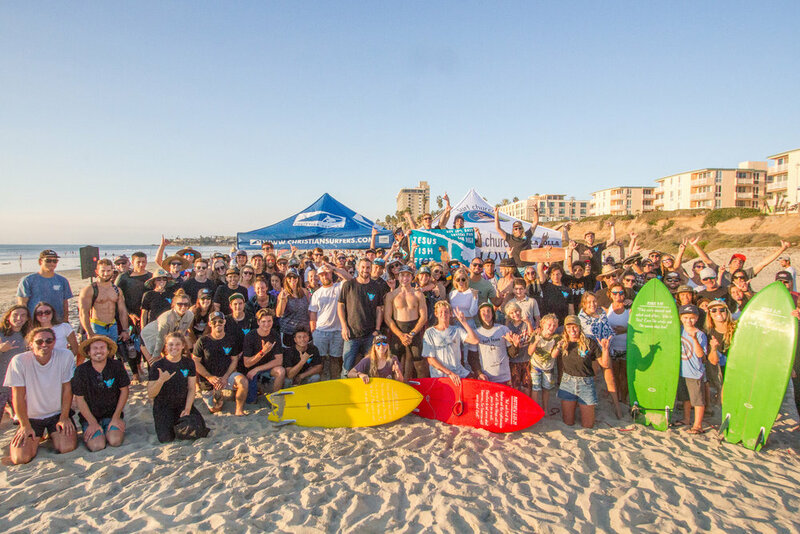 The heart of this was more than just a surf competition, it was a community stoke-fest meant to share joy and bring the San Diego surfing community together in a positive, uplifting way. The culmination of this fest was the lucky draw giveaway for the fish surfboards. Every surfer, whether they came in first place or lost their first heat, had the same chance to go home with one of the boards at the end of the day in the lucky draw. Each of the eight fish surfboards represented one of the Gospels which tell the story of Jesus life and featured a unique scripture verse on the bottom of the board. There was a message shared about each of the boards and a whole whack of prayer from the various churches and organizers that went into the selection process. It was amazing to see who was chosen to go home with each board and uplifting for all who were present. Concluding it’s third year, the Jesus Fish Fest has now spread twenty custom Hank Warner fishes to lucky surfers across San Diego county lineups. In John 21 when Jesus poses the question about having any fish to his friends, the Bible says they had been fishing the whole night and hadn’t caught anything. His friends told him this and Jesus said to throw their nets on the other side of the boat. Miraculously, in doing so, they caught so many fish they were unable to haul in their nets. Sometimes we need to throw our nets on the other side of the boat, get outside the box, and mix things up to find a different type of joy. This is what made the Jesus Fish Fest so special and lead to lineup full of fishes.